San Diego Police Have Captured the Gumby Bandit! SAN DIEGO — Gumby has turned himself in, green suit and all. Jacob Kiss, 19, the man who detectives said tried to rob a Rancho Peñasquitos 7-Eleven last week dressed as the famous claymation character, surrendered Tuesday with an alleged accomplice, San Diego police said. Robbery unit detectives contacted Jason Giramma, 19, last week and told him that he and Kiss needed to turn themselves in, police spokesman Detective Gary Hassen said. The two men voluntarily went to police headquarters, where investigators interviewed them Tuesday morning, Hassen said. He said Kiss brought the Gumby suit and detectives confiscated it. Kiss and Giramma were then released. The case was sent to the District Attorney’s Office to determine what, if any, charges will be filed against them, Hassen said. Police said a man in a Gumby costume and an accomplice went into the store on Carmel Mountain Road near Paseo Montalban on Labor Day about 12:30 a.m.
Surveillance video showed the smiling character walking into the store with his arms raised over his head. The employee, who did not recognize the Gumby character, thought it was a prank and dismissed him, police said. Gumby insisted he was serious and said that he had a gun, but when he tried to reach into his pocket the costume got in the way. After fumbling around for a minute all he managed to do was drop 26 cents. In the meantime his accomplice, who was not dressed as a cartoon character, had already gone outside and was in a minivan, honking the horn. The video shows the clumsy would-be robber struggling to keep the green suit on as he walked out the door. When this happened, I thought it was one of the best things I’d ever seen. I wrote all about how awesome I thought it was. Now, the Gumby Bandit has turned himself in… and the police have stolen his costume. Stolen. His. Costume. His calling card! Police thievery! 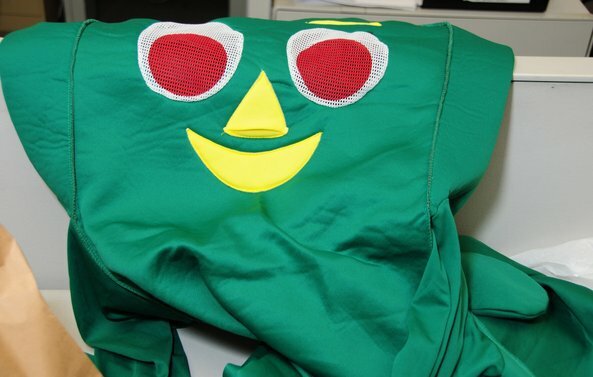 The Gumby Bandit… c’mon man, you’re just gonna turn yourself in…AND your costume? You gotta keep that baby forever. Now let’s get to the heart of the story. “The employee, who did not recognize the Gumby character, thought it was a prank and dismissed him, police said.” What. “The employee, who did not recognize the Gumby character” “did not recognize the Gumby character” You didn’t recognize Gumby?! Bro, let’s wake up a bit on the cultural literacy, huh? I don’t care who you are… you gotta know Gumby. I mean, where does Gumby come in on the world’s most recognizable characters list? Like 5th? That sound right. Fifth. Behind Mickey Mouse, Santa Claus, Michael Jordan and Alf. Didn’t recognize Gumby… you should be ashamed of yourself. This entry was posted in News and tagged 7 eleven, 7 eleven gumby, 7 eleven robbery, 7-11, 7-11 gumby, 7-11 robbery, Carmel Mountain Road, gumby 7 eleven, gumby bandit, Jacob Kiss, Jason Giramma, the gumby bandit. Bookmark the permalink.